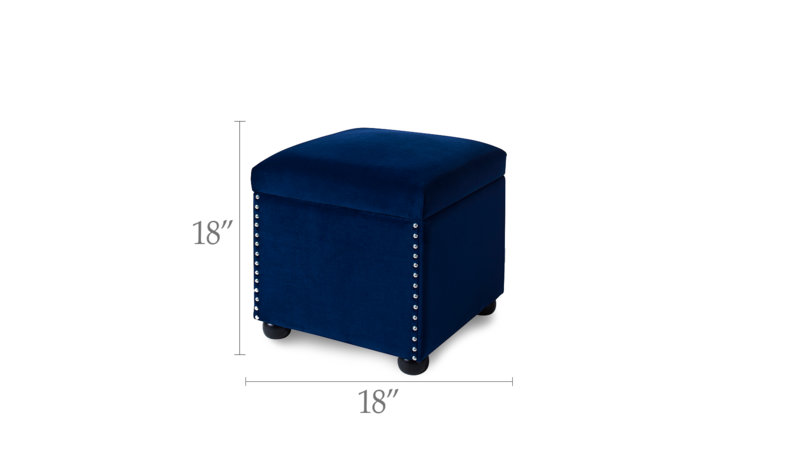 The Hailey Collection storage ottoman by Jennifer Taylor Home aims to enhance your décor and add functional storage to your living space. The hinged seat cushion lid is generously padded with quality high-density foam for use as a comfy seat, or a soft place to rest your legs. The spacious interior is roomy enough to stow away most anything you have laying around that needs a home. Constructed to last, this handmade ottoman features a solid kiln-dried birch wood frame and is upholstered in durable premium fabric. Design elements such as the nailhead accents and solid wood biscuit feet makes the Hailey an ideal choice for the entryway, living room, or master bath. Jennifer Taylor Home offers a unique versatility in design and makes use of a variety of trend inspired color palettes and textures. Our products bring new life to the classic American home. Color is beautiful. Well constructed and a lovely accent to the room. Storage is a bonus! A great addition to my blue velvet chairs, light beige chairs and couch, and additional blue ottoman. Great seating by the fireplace. Best purchased ever made from online! This Jennifer Taylor Hailey Storage Cube royal blue is a very beautiful piece good quality and solid. The only problem we have is the colour is a bit off compare to our sofa colour. I should have request a swatch before purchasing it. I love it! The interior lining is very nice and the storage is wonderful.